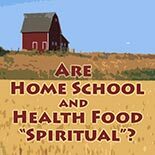 Are Home School and Health Food "Spiritual"? When believers start clinging to external subjects - "Home school is God's way to teach children," "salad is good, french fries are bad" - that's the tree of the knowledge of Good and Evil. Christianity is fellowship with Jesus, not adherence to a supposed proper set of behaviors. Are you so sure you know what's right and what's wrong? Modesty: Why Do You Do What You Do?